Minutes of the Adel Neighbourhood Forum – Full Forum meeting held in AWMA on Monday 16th May at 7.30pm. Including the Co-Chairmen, Secretary and some members of the Steering Group there were 20 people in attendance. Apologies were received from Graham Bond and Vivienne Duke. Ian Bond Co-Chair welcomed everyone to the meeting. He outlined the purpose of the Forum which is to produce the Neighbourhood Plan (NP). Ian recapped on the timelines of our work. The Policy Intentions Document was produced and delivered to all households last summer. He asked “Why have a NP”. It cannot be a wish list. Communities need to think about development in their area. It is not for stopping development. What do residents want to see in the policies document? What is reasonable? What do residents support? This was all part of our consultations held over the last 2 years. Once the final plan is produced we have to consult again to ensure residents approve it. Once the referendum has been held and the Plan approved it becomes part of a suite of documents that developers and planners have to take into consideration in planning law. Darren Carroll our consultant has now helped us to shape the policies. Nick Brown, Co-Chair, has been working on the plan and has produced a few copies for tonight. All key elements of the plan and the policies along with diagrams are in the document. This will help to bring it to life. Not totally complete but it is in draft. Nick feels we are 90% there. It also explains the consultations and the pre-submission process. It tells the history of Adel and how we came into being as a Forum. It summarises the issues as a result of the consultation. It has 18 objectives that have evolved into 6 policy objectives. In the Plan the policy areas are colour-coded. The final part is projects that have been identified through the consultation. Nick also explained the CIL contributions from developers (Community Infrastructure Levy) and how this would be allocated. Part of the next consultation will be asking people to prioritise this funding and if there are any new projects to add to what was already identified. There are also concept plans in it. Ian outlined the various developments that are ongoing and due. We are now at the stage where there are 3 sites where we need to put concepts forward – Old Adel Reformatory site. Ian explained how this site is very difficult. Contains a Grade II listed building that is falling down. The land attached is also earmarked for development. The Dunstarn Lane site – bit next to the Heath and also the adjoining green field site (see below). Site Allocations process ongoing – 2 other sites where development should be resisted – opposite the church and the green field site at Dunstarn Lane. What the Forum is trying to do is find a way of putting forward as many reasons as possible not to build on these 2 sites. We are happy to build on the old Adel Reformatory site. We have a plan for development there that intensifies the number, and in the Dunstarn Lane site, to avoid having to use the land opposite the church or the green field Dunstarn Lane site. We have advised the Council of our alternative plans for the old Adel Reformatory site. We want smaller units (flats/houses) plus commercial use and bring the swimming pool area back into use. Dunstarn Lane site has a pre-app submission for the part next to the Heath but it is standard developer fare and unimaginative. A lot of trees would be lost and it is out of character with the Heath. We would like to see smaller concentrated dwellings and a design that fits in more with the Heath. The Council needs to maximise the amount they can get for the old Adel Reformatory site. When we go to consultation people need to be clear what we are putting forward. The third site that has been a subject of debate for us is the land opposite the church. We know there are developers who want the site and are happy to see it developed. This land is close to most people’s hearts in Adel. We discussed as a steering group whether to put any proposals in the NP for this land. We thought we could put forward pushing any development to the west side of the stream only. The land is also adjacent to the Conservation area. Being in a conservation area does not stop development happening it just protects what might be achievable. We are still developing our thinking on this. Sarah Rushton, a Steering Group member, explained what she is hoping to do in terms of describing how we might put this land into an extended conservation area proposal. We have a letter of support from Natural England (formerly English Heritage). In terms of extending the conservation area this is something that the steering group needs to work on. If it is successful and development ever takes place on the land within it, it would have to be of the highest standard. The significance of the site has been recognised by subsequent Planning Inspectors. Other issues for that site are highways access, school places, GP capacity, and public transport capacity. Ian talked about why people are attracted to Adel. One of the reasons is its green space. Are there any unprotected green areas that need to be recognised in the NP? We have drawn up a list of areas that we would like to see designated as green space. Ian said we are working on this and Paul Simkins of the Steering Group has this responsibility. Ian cited the American Plantation as an example plus the land at the back of Adel Primary in the Adel Woods. In the NP draft we have identified 22 green sites. We see Bedquilts as a key area to be protected. Land off Holt Lane (Devil’s Field) has potential to be a pedestrian route through to Golden Acre but is currently inaccessible to pedestrians. Residents will be able to comment on the identified green space and whether there is any to add or remove. We have to describe each one as to its value to the community using available set criteria for NPs. Although Leeds wants a Tour de France and a Tour de Yorkshire legacy there are not many cycle tracks in the locality. Ian explained what we would like to see for cycling and for walking. The cycle ways cannot be roads to nowhere they need to connect up. We need to improve home to school transport and cycling might be an option if we can get this right. Jeremy Emmott, a Steering Group member advised that we have an aspiration to get from Adel through to Paul’s Pond via the golf course if we can negotiate a path through with the Golf Course management. We would also like to get to Golden Acre on foot and the current path is not really ideal. The Beech Walk or Old Damstone Lane is still an avenue of old beech trees running from Adel on the Otley Road through to Golden Acre and can still be seen and if this could be made passable it would make a nicer walk to Golden Acre but it is in private hands. We would need to look at legal documents going back 2 centuries. We have someone looking into this. As far as the next stage is concerned we have to submit our plan to the Council who will appoint an independent Inspector to look at it. Before that we have to consult with the community again and amend the plan if necessary. We aim to put a flyer out to all households early September for public meetings in early October. We cannot afford to distribute copies to all households in Adel. We will ensure the finished document is on the website. We shall highlight the main points in the flyer and we shall hold pubic consultation meetings in 4 venues in Adel. We shall make copies available in public venues such as the Holt Park Library. Once the final version is approved by the independent inspector it will go to a referendum of all Adel residents. We need 50% of those who vote in the referendum to approve the plan. Ian gave an update on the financial position. We now only have £736.52 once cheques are presented. We are not asking for more money now but we need to be aware that if we have to start employing Counsel to fight anything we would not have the money. The next meeting of the full forum is to be agreed. 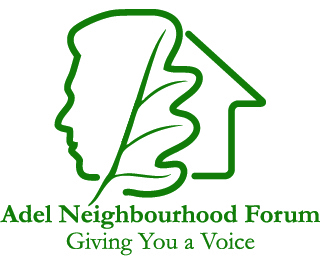 Please note the next full forum open meeting of the Adel Neighbourhood Forum is TBA sometime in July 2016. All residents and local connections are welcome!